E. Coli on the loose Again? Aha! Just when I’ve decided to hate Taco Bell….An outbreak of E.Coli in 6 states has been tentatively linked to Taco Bell restaurants. The Centers for Disease Control and Prevention are still investigating possible sources, but one Taco Bell volunteered to shut down temporarily after several of its workers contracted the illness. Other Taco Bell locations have recalled some suspect green onions. You can all eat spinach again! Whee! The FDA identified the brand of spinach that was contaminated, and bags packaged between certain dates have all been recalled. Spinach should be reappearing on grocery store shelves any time now. 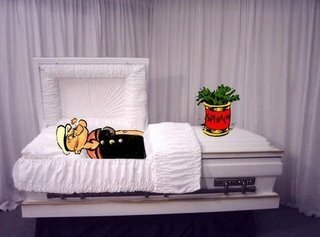 They found the bad spinach! Ok, well it’s not really an update since they haven’t figured anything out yet. Now stores are removing ALL fresh spinach, not just bagged. The number of illnesses due to E. Coli reported has reached 131 people in 22 states. My Public Health professor informed us that the CDC or the FDA or whoever is doing the sampling of spinach in San Fernando Valley, CA didn’t find E. Coli anywhere- so it looks like we’re back to square one. In other news, tomorrow is Wednesday and that means the Farmer’s Market is happening on Wriston Quad. AND there’s going to be a CORN SHUCK-OFF from 11am-2pm! I wanted to participate in what promises to be a spectacular display of master shucking…but no one wanted to join my team. Oh well, I’ll still watch. 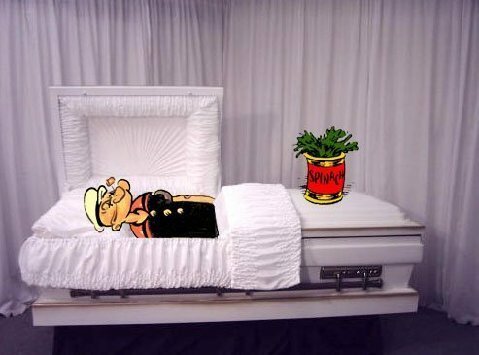 Sorry, Popeye, no spinach today. You’ve probably heard by now, but don’t buy bagged spinach any time soon. Hundreds of people have gotten sick due to spinach infected with E.Coli. Unfortunately, the CDC has not been able to locate the source of the bacteria, so grocery stores and restuarants are pulling spinach off their shelves and menus until further notice. Even Brown’s dining halls have done away with spinach and mesclun mix at the salad bar. A similar outbreak of the dangerous bacteria occured in 2005 when a few dozen customers became ill after eating Dole bagged salads. E. coli is a bacteria that can live in the intestines of cattle, and can then infect fruits and vegetables that have been planted in manure-fertilized soil.